WoPC Home > U.S.A. > American Bank Note Co. 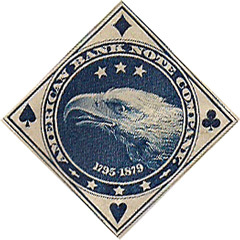 The American Bank Note Company was a long-established firm producing national currency, finely engraved stock certificates and other security printing, including postage stamps and American Express “Travelers Cheques.” Like others before them they entered the playing card market, but only to pull out again after a short time (c.1908-1914). Their Ace of Spades design includes the dates 1795-1879 which refer to the year the company was originally founded as Murray, Draper, Fairham & Co., as well as the year in which it merged with the National Bank Note Company and the Continental Bank Note Company. 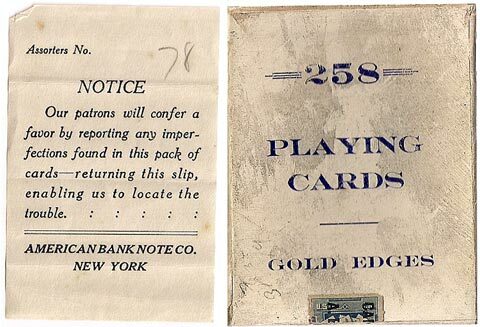 In spite of its excellence in other areas of printing, the Company probably found the making of playing cards to be more problematic than they had anticipated and hence they quit at an early date. 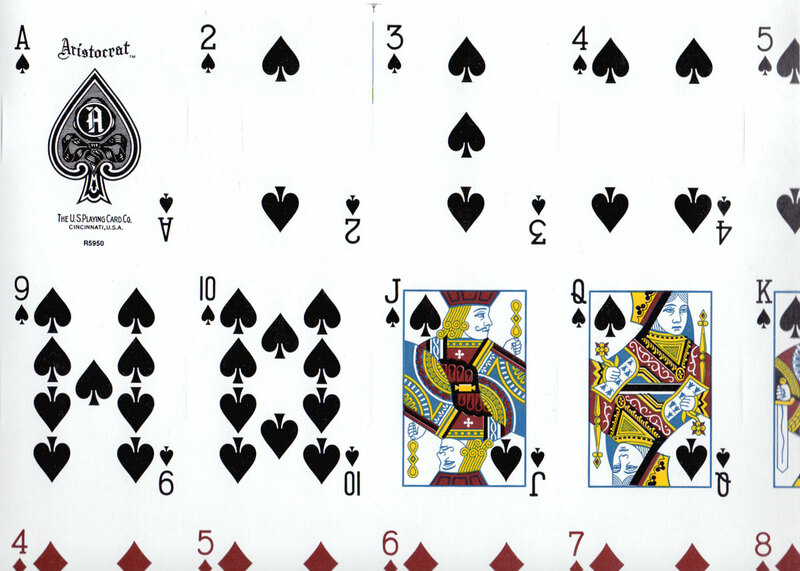 The stock on which playing cards are printed should consist of thin sheets of paper pasted together with a black paste to ensure their opacity. 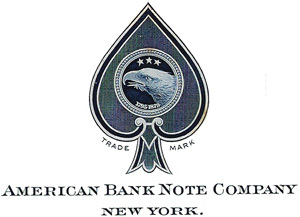 American Bank Note Company decks do not have the opaque black paste liner. When a card is held before a bright light, both sides of can be seen! The cards would appear to have been printed on a single sheet of paper. Possibly this problem contributed to the decision to sell the playing card business to the Russell Playing Card Company in 1914. Whatever the reason, the surviving decks by The American Bank Note Company, all of which are now over one hundred years old, are true Americana. Above: a less common Joker with Punch sitting on a lion, and three different pictorial back designs issued by the American Bank Note Company. The right-hand card depicts King Louis XVI, King of France and husband of Marie Antoinette who is on the card beneath him. 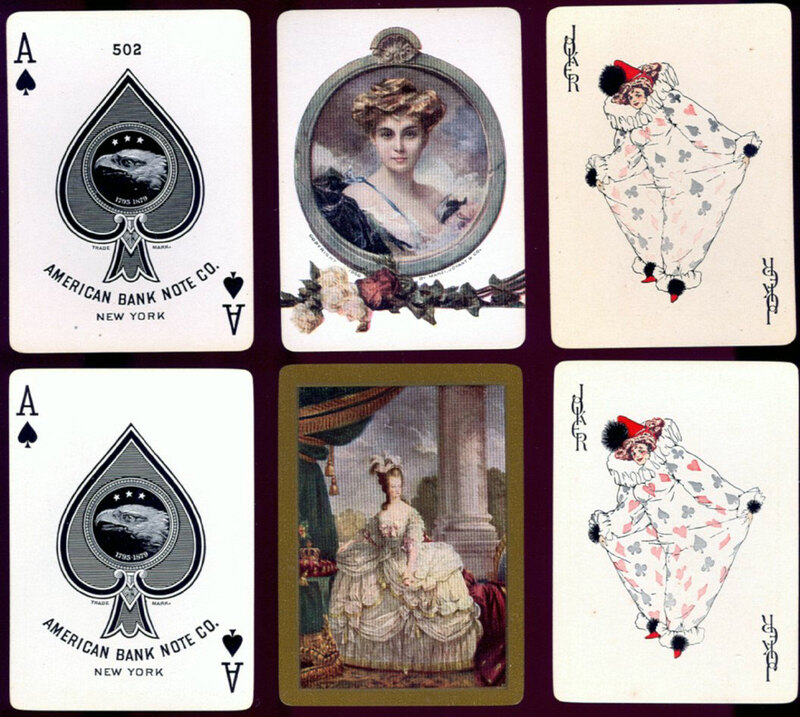 Above: American Bank Note Co. playing cards with elegant pictorial back design, c.1910 (click to zoom). ← Left: a company seal from a playing card wrapper. There were at least two or three variations of the ‘stock certificate’ or ‘bank note’ back design and when the company was eventually purchased by the Russell Playing Card Company they were continued in Russell’s Aristocrat brand. 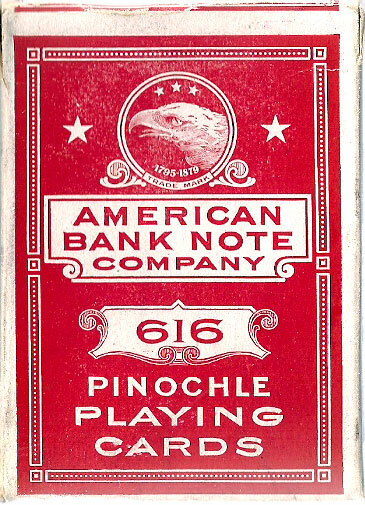 Above: American Bank Note Co. Pinochle 616 playing cards with 'banknote' or 'stock certificate' back design. Although it had been out of print for many years, USPCC reprinted a similar 'banknote' back in 2011 on their "Aristocrat" brand. In 1913 the Willis W. Russell P.C. Co. merged with the Kalamazoo Playing Card Co. to form the Russell Playing Card Company which, in 1914, acquired the playing card business of the American Bank Note Company who had decided to discontinue their playing card line. Accordingly, it would appear that the American Bank Note Company produced playing cards for about a six year period, i.e. c.1908-1914 but nevertheless left a lasting heritage in the industry in the form of their successors. The American Bank Note Company's court card designs include a right-hand pip on the QH with the consequent shifting of her head to the left and the left-facing profile JS. 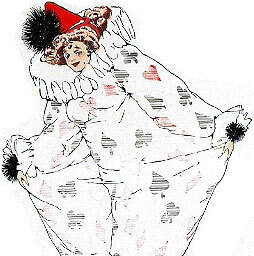 These, along with the “Baggy Clown” Joker, were acquired by U.S.P.C.C. via their purchase of Russell P.C.Co. in 1929. They were used by U.S.P.C.C. since c.1955 in Congress, Aristocrat and other bridge-size decks and have been copied with modifications by a number of other makers (e.g. Stancraft), as well as being the inspiration for Australian and Chinese imitations. Starling, Rod: American Bank Note Pictorials, in 'Clear the Decks', the Newsletter for 52 Plus Joker (edited by Judy Dawson), September 2011.